On the seventh day, instead of resting from the steam train ride the day before, Wendy and I drove to Mesa Verde for the fabulous views. We slept late after the exhausting but fun train ride the day before. Rain was forecast for the afternoon, so we eventually roused ourselves to drive west, under a low overcast sky, the 35 miles to the entrance of Mesa Verde National Park. I’d learned ahead of time that touring Cliff Palace and most other major sites now requires the on-site purchase of tickets, although a self-guided tour of Spruce Tree House is still possible. Given that we were still recovering from the long train ride, I doubted we would do much walking this day, mainly driving the loop roads past various overlooks. Back in 1991 my father and I toured the Cliff Palace and Balcony House ruins. We stopped for a restroom break at the busy visitor center, which just opened this May and cost over $16 million. It is also a research center, with more than three million artifacts from 4,000 Ancestral Puebloans who lived in the area for 700 years, from about 600 to 1300 CE. We had limited time before afternoon showers were forecast, so we did not even go inside. 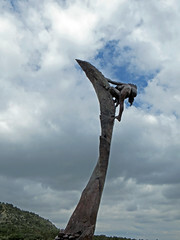 But we did study the sculpture out front, Anasazi by Edward J. Fraughton. It wasn’t easy against the glare of the overcast sky to make out the laden Pueblo Indian figure climbing the spire until you got fairly close to interpret it. 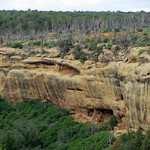 Modern-day Puebloan Peoples do not prefer the term Anasazi, which is Navajo and originally meant “enemy ancestors”, but the alternatives are more cumbersome. Knowing we needed to beat the afternoon showers, we drove on to the park entry booth to pay the $15 entry fee for our vehicle and begin driving the 21 miles through the park to Cliff Palace, the largest and most famous of the cliffside ruins. Beetles and fires have scourged the trees at the park, leaving hillsides littered with dead trunks. But you could peer between the trees for gorgeous views to the west from the mesa top. One stop had spiky Wyoming Paintbrush wildflowers. The heavy sky made it feel like you were at the top of the world. Wendy took advantage of a gap in the clouds for a very nice shot of the sun kissing the mesa rocks. We reached the Cliff Palace overlook, which was crowded with sightseers like us. I went back to grab my binoculars for better views of the tour going on below. Wendy and I both wondered about a group of disks on the floor of one kiva; maybe they are part of the ongoing reconstruction effort. Cliff Palace once contained 150 rooms and 23 kivas, which were special rooms used for religious practices, and had a population of approximately 100 people. The first view of it by white cowboys was in 1888, and it was subjected to looting until the park was established in 1906 and Jesse Walter Fewkes of the Smithsonian Institution excavated and stabilized it in 1909. The rooms were constructed out of natural sandstone, wooden beams, and mortar made of soil, water, and ash. Tiny pieces of stone called chinking are also embedded in the mortar, to strengthen construction. Ancestral Puebloans entered their cliff-dwelling apartments through wooden ladders, and the rooms were about six by eight feet. Families lived together, and historians say that two to three people probably shared a room. Many rooms were originally plastered in bright colors—usually pink, brown, red, yellow, or white. Smaller rooms near the back of the cliff were used for storing crops, such as beans, corn, and squash. Each clan or family had their own kiva in front of their dwelling for rituals and ceremonies. After drinking in the view and climbing back up the hillside to the road, Wendy and I rested on a bench, unused to the altitude. 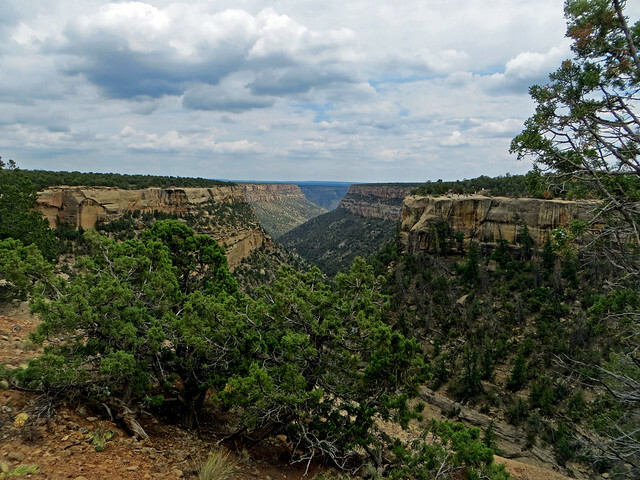 We then drove the loop roads, stopping repeatedly to get out and walk over to the edge of the mesa for the views. We skipped Balcony House, since it is not visible from the road and we had no tour tickets, instead driving on over to the Mesa Top Loop for views of Navajo Canyon. Nestled up against one wall in a high alcove was Square Tower, which was being stabilized by two workers. Square Tower House was occupied between 1205-1281 CE. 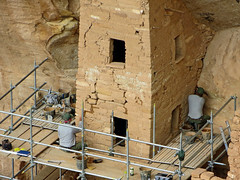 It contains one of the latest construction projects at Mesa Verde, the Crow’s Nest. Square Tower House was built at the height of the region’s population, when their numbers were beginning to negatively impact the area’s resources. 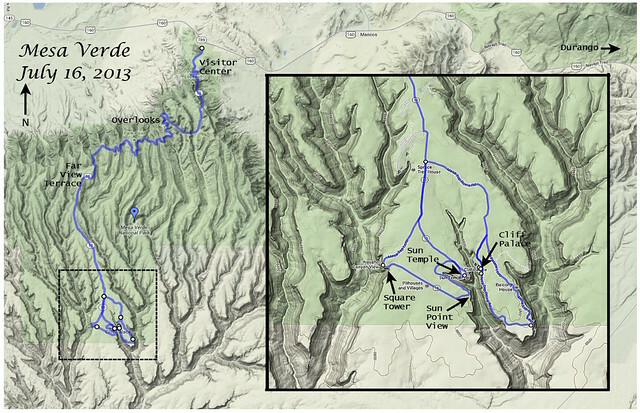 It is believed that many factors, including a 23-year drought, resource depletion, and social pressures led the people to gradually migrate south to the Rio Grande area, leaving the Mesa Verde region largely depopulated and abandoned. Sun Point View was our next stop and was our favorite, providing views of six sets of structures in Cliff and Fewkes Canyons. 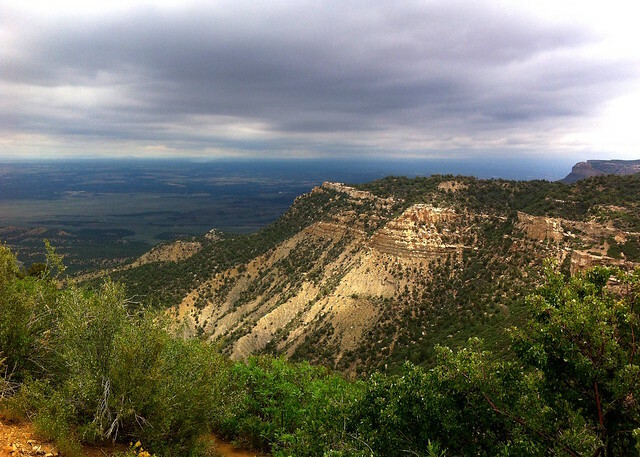 Half the population of Chapin Mesa was concentrated here between 1200 and 1300 CE. Wendy and I enjoyed zooming in for views of each dwelling. 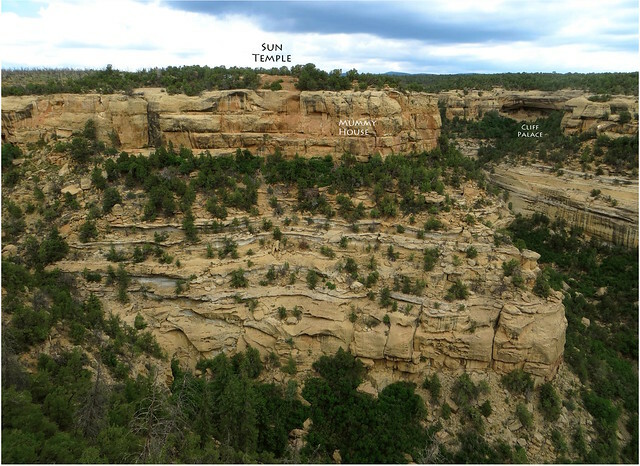 Fire Temple is on the far left up Fewkes Canyon, and was recently re-opened to the public via a hiking trail. New Fire House is a two level structure adjacent to the temple. 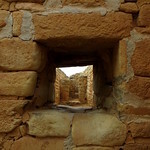 The lower level has seven rooms and three kivas, with thirteen rooms on the upper level. It may have been the dwelling for the people responsible for ceremonies in the temple, which resembles the floor of a great kiva, with two rectangular structures which may have been foot drums for dancing, and a central circular fire pit which had a large amount of ash when excavated by Fewkes. Oak Tree House, also on the left up Fewkes Canyon, contains about 50 rooms and six kivas. Some of the structures rose four stories to the roof of the inner alcove. There are storage rooms on the upper ledge. It has a deep cave with roofless living rooms, grinding and cooking rooms, and some storage rooms. One of the more unusual walls found was made entirely of willow branches set in mud (rather than masonry), and some of the masonry walls were of the highest quality stonework present in cliff dwellings of Mesa Verde. Both Fire Temple and Oak Tree House are situated in alcoves where occupants could enjoy sun in the winter and shade in the summer. Cliff Palace is up a canyon to the east, and is in the center of the view from Sun Point. From there one can easily spot the sightseers at the Cliff Palace overlook, where we had been earlier. 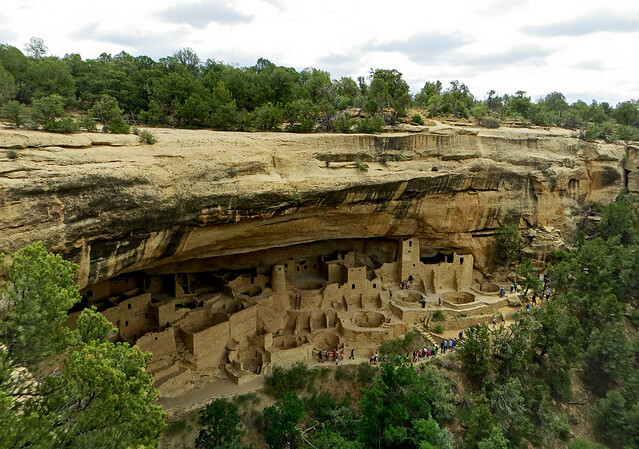 Sunset House is farther south along the main canyon and contains 33 rooms and four Kivas set on two ledges. Behind the prominent two-story structure were three dry-wall masonry turkey pens. Inhabitants carried water from a spring opposite Cliff Palace. Sun Temple is a structure on the top of the mesa where Fewkes Canyon forks off the main canyon, and we would soon drive over to examine it. Mummy House was constructed on a narrow ledge below the top of Chapin Mesa, directly below the Sun Temple. It once extended higher, with an upper penthouse in a niche being very well preserved; it may have been a granary. Only the wall stubs of ten rooms and two kivas remain on the ledge below. Fewkes found a well-preserved mummy there. We drove around to the Sun Temple, on top of the point where Fewkes Canyon splits off. It has a spectacular view of the canyon and Cliff Palace, and is a D-shaped structure with a thousand feet of double-coursed walls filled with a rubble core. Masons pecked the stones and, since no household goods nor roof beams were found here, the 30-room structure was probably never finished. A view down one of only two small windows in the structure showed how cramped some of those rooms were. Wendy captured me pontificating about the masonry, noting what I’d learned in the guide book. Approaching rain led us to the Far View Terrace for a restroom break and drinks. 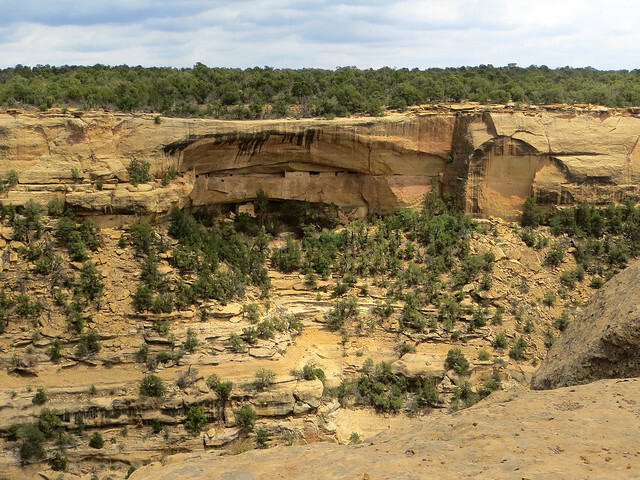 The Far View area of the park was one of the most densely populated parts of the mesa from 900 to 1300 CE. Nearly 50 villages have been identified within a half square mile area. We left the park, enjoying some final panoramic views. Raindrops sprinkled down as we fled back through a tunnel toward the park’s north entrance to return to Durango. While at the Far View Terrace, I’d placed a reservation at Ken and Sue’s. The grilled filet mignon with Gorgonzola butter, spinach, and potato lasagna they served me was superb. We then drove east back to Pagosa Springs for the night, ready to spend the next two days heading home, including stops in Walsenburg and Dodge City.